They were trying to escape being bullied. 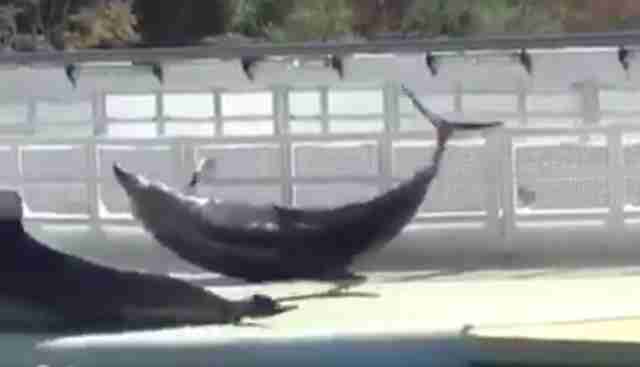 A distressing video shows two stranded dolphins who appear to be desperate to escape their marine park tanks. The video, which was reportedly taken at Kyoto Aquarium in Japan, shows two dolphins lying out of the water, apparently stuck on the concrete deck next to their tank. One of them appears to be in distress, turned on his side and thrashing his tail in the air. The other one begins to thrash, pushing himself out of the tank, then lies still, his mouth agape. Eventually a staffer walks over. She pushes the second dolphin half into the water, but he thrashes again, pushing himself back out of the tank. The video then cuts off. It's unclear how long the dolphins were lying there before the staffer arrived, and there are few details about when the video was taken. But according to David Perle, a spokesman for PETA, the dolphins were likely trying to escape the rampant bullying that's common in marine park environments. "It is likely that the dolphin became stuck after being chased by others in the tank," Perle told The Dodo. "The animal clearly is stuck and struggling and requires trainer assistance to get back into the water." This would hardly be the first time it's happened. Last year, two videos emerged showing Morgan, a wild-caught orca who's one of several SeaWorld keeps at Spain's Loro Parque, beaching herself on the side of her tank to escape extensive bullying from her tank mates. In one of the videos, she appears to be bleeding from her chin. And former SeaWorld employees have attested that the same behavior happens in U.S. marine parks. Sarah Fischbeck, a former water quality diver at SeaWorld San Diego, formerly told The Dodo that she saw regular instances of aggression among the dolphins and orcas, including one case where a baby dolphin became so panicked by the harassment that he darted into a wall and died. "We'd be the first ones to the pool most mornings ... and more than once we found a dolphin pushed out of the pool by the other dolphins," Fischbeck said. "Just laying on the concrete." Of course, while this behavior is a sad fact of captive life in marine parks across the world, Kyoto Aquarium's dolphins have it even worse. The park reportedly buys its dolphins from the brutal drive hunt in Taiji, where entire dolphins families are rounded up by hunters. The "prettiest" ones are captured and sold to places like Kyoto Aquarium and other marine parks around the world - a trained dolphin can fetch well over $100,000. Their families are butchered for their meat or thrown back into the ocean, traumatized - in some cases, nursing babies have even been thrown back into the cove without their mothers. In this case, it's quite possible that these dolphins faced the trauma of losing their families to the hunt before being forced to live in the aquarium's overpacked tanks. And on top of all that, and the stress of being bullied, there are immediate health concerns about their beaching behavior, Perle said. "Dolphins outside of the water become easily overheated, especially if they are struggling, so this type of an incident is certainly a health risk," he explained. In any case, there's one simple way to avoid supporting the industry: avoid anywhere that features captive or performing dolphins and whales. "The dolphin (and whale) trade is an incredibly lucrative global industry that preys on human interest in these incredible animals," Dolphin Project, a group that's fighting to stop the global dolphin trade, wrote online. "When they're not doing flips for you, most dolphins are treated poorly. In spite of their naturally 'smiling' faces, it's pretty much impossible to keep dolphins happy and healthy in any captive setting." To take a pledge not to visit dolphin shows, and to find out more about how you can help captive dolphins like these, visit Dolphin Project.